D.N.A. , C.S.I. , and Good Old Fashion Detective Work Nabs a Residential Burglar! In October of 2018, a residential burglary occurred in the 2700 block of Woodrow Avenue. The suspect in this case broke into the home while the residents were asleep inside and stole several valuables. While inside the home, the suspect located the keys to the victim’s 2006 Jaguar and stole that as well. During the burglary, the suspect errantly dropped a bandanna inside the victim’s home. The day after the burglary, the victim’s vehicle was recovered in the 5200 block of Los Angeles Avenue. A diligent patrol officer processed the victim’s vehicle for fingerprints. A single fingerprint was recovered from the driver’s side door of the victim’s vehicle. This case was assigned the Simi Valley Police Department’s Property Crimes unit. The assigned Detective submitted the fingerprint for identification and comparison. Additionally, the Detective submitted the discarded bandanna to be processed for D.N.A.. In the beginning of March, 2019, the handling Detective received word from the forensic laboratory that the D.N.A. on the bandanna and the fingerprint recovered from the stolen car were from the same suspect. 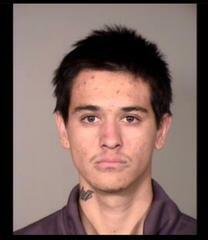 The suspect was identified as 22-year-old Jonathan Maldonado of Los Angeles. On March 19, 2019, Maldonado was located by the Simi Valley Detective Unit in the City of Santa Monica. He was subsequently arrested and charged with Burglary and Grand Theft Auto. His bail was set at $50,000.